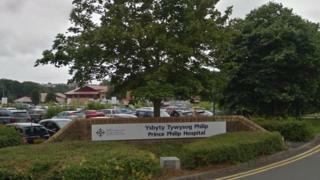 "Serious failings" have been identified in the care of a 79-year-old man who died shortly after being declared fit for discharge at Prince Philip Hospital in Carmarthenshire. The Public Services Ombudsman upheld complaints about Hywel Dda University Health Board by the patient's daughter. She said doctors were slow to respond to her father's deteriorating condition which resulted in cardiac arrest. The health board said it was committed to learning from its mistakes. The patient, known in the ombudsman's report as Mr F, was admitted to hospital on 6 May 2014 for a hip replacement. He was seen by a junior doctor the next day, but records show he was not seen by a doctor in the three days following. When he was seen by two consultant surgeons, neither were said to have recorded their reviews of Mr F.
On 14 May, a junior doctor said Mr F was fit to be discharged, but nurses did not conduct a final set of observations. When his family came to collect him they reported Mr F was feeling unwell. He was seen by junior doctors who believed him to show symptoms of sepsis, probably caused by intestinal obstruction. After tests, Mr F said he was feeling better and his family left him to rest. They were later contacted at home to say Mr F had gone into cardiac arrest and had died. Clinicians failed to advise the family of Mr F's poor prognosis and the family was "denied the opportunity of being with him during his final hours"
Mr F's medical notes were reviewed by the health board's clinical director who concluded that, despite shortcomings in his care, the outcome for him would not have been different. They also stated the bowel obstruction played no part in his deterioration or death. But Ombudsman Nick Bennett, upheld the complaints. He said "critical decisions" surrounding the diagnosis and treatment of Mr F's deteriorating condition should not have been left to junior doctors, who were "clearly in need of the support and experience of senior clinicians". He was also concerned Mr F was not seen by a doctor for three days after his surgery and that the consultants did not record their reviews or any decisions made about his care. Mr Bennett concluded: "I consider these failings to be serious and, taken together, create uncertainty around the question of whether Mr F's death was, as the health board suggested, inevitable." He recommended the health board give Ms D a full written apology and make the family a payment of £2,500 plus £250 for its poor complaint handling. Other recommendations included producing a detailed escalation policy and making it available to clinicians of all grades at the hospital. Hywel Dda University Health Board said it acknowledged the failings and accepted the recommendations. Medical director, Dr Phil Kloer expressed "genuine regret" they did not provide the high standards of care they aspire to. "We are a health board that is absolutely committed to learning from its mistakes to ensure we do not repeat them," he said. "Through our own internal investigation and the findings of the ombudsman, we have put in place a robust set of measures to deliver the required improvements to prevent a situation like this from reoccurring." Dr Kloer added: "We understand and appreciate that the publication of this report will be very upsetting for the family and we sincerely apologise for this."